"Bob, I read your opinion of Cohesant Technologies from a few years back and wondered if you still have a positive opinion. I like the way you think, and have a huge position in the stock (about 20,000 shares of my own, 40,000 for my clients). I like the management strengths and continuity, the high GM, the high ROE%, the lack of debt, the consistent performance over the last decade. Just wanted to see if you still held a positive opinion of the company. I manage a great deal of money in the water sector, and see this equity as the great nascent player in the water infrastructure business. The only problem is that is is not followed by analysts, not held my mutual funds, and I sometimes wonder why it is that it looks so great to me but day in and day out, the only shares traded in the stock are ones I traded (bought, actually.... I have never sold a share). A tip for you--You might look at the high quality credentials brought over by the new CEO at SWWC.... look at the website for his previous company... SWWC has not lost money for shareholders in any year in the pat 10, according to Morningstar. That company is going to shine bringhtly in the coming years. Thanks for any counsel you can offer. Best regards"
Thank you so much for writing . I would be happy to take another look at Cohesant (COHT). As you pointed out, I posted Cohesant Technologies (COHT) on Stock Picks Bob's Advice on June 24, 2004, almost two year ago when it was trading at $10.06. 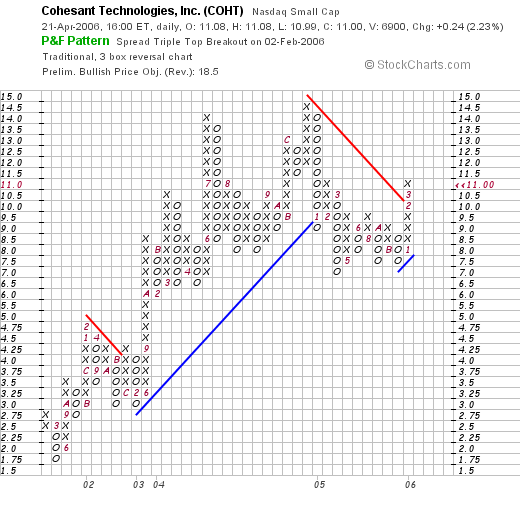 COHT closed at $11.00 on 4/21/06, giving me a gain of $.94 or a gain of 9.3% since posting. As you probably know, I have a rather simple approach to looking at stocks. I would be happy to run through some of these same 'screens' and see what happens today. Let's take an updated look at this company. "...through its subsidiaries, engages in the design, development, manufacture, and sale of dispense equipment systems, replacement parts, and supplies. 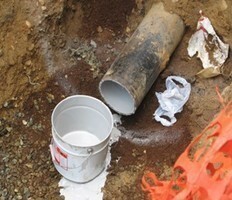 The company also offers specialty coating and grout products. 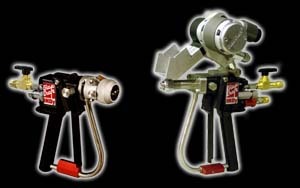 It designs and manufactures dispense equipment systems, which are used to dispense multicomponent formulations, such as fiberglass reinforced plastics, polyurea and polyurethane coatings, and polyurethane foam." 2. What about the latest quarter? On March 24, 2006, Cohesant reported 1st quarter 2006 results. For the quarter ended February 28, 2006, 'consolidated net sales' increased 51.7% to $6.47 million from $4.26 million the prior year. Consolidated net income came in at $379,672, a 59.8% increase over the $237,635 reported in the same period the prior year. On a per share basis this worked out to net income of $.12/diluted share, up 33% from $.09/diluted share the prior year. So far so good :). This certainly was a strong quarter. 3. What about longer-term results? Reviewing the "5-Yr Restated" financials on COHT from Morningstar.com, we can see that while this is a very small company, the company has been experiencing fairly steady revenue growth from $16 million in 2001 to $22 million in 2005 and $24 million in the trailing twelve months (TTM). As is often my observation in these smaller companies, the earnings growth is not quite as steady, with $.44/share reported in 2001, increasing to $.67/share in 2004. This did drop to $.57/share in 2005, but has rebounded to $.60/share in the TTM. An added plus is the fact that the company initiated a dividend of $.25/share in 2003 and increased it to $.26 in 2004 and again to $.27/share in 2005. While a dividend is not essential for an investment, it adds an extra element for many investors. Also nicely, the company which had 2 million shares in 2001, increased to 3 million in 2002, and has kept that 3 million shares in 2005 and in the TTM. Free cash flow is positive at $2 million in 2003, $3 million in 2005, and $2 million in the TTM. The balance sheet appears solid with $1.2 million in cash and $9.1 million in other current assets, giving us a current ratio of 2.86 when compared to the current liabilities of $3.6 million. In addition, the company has negligible long-term liabilities, recorded as $.2 million on Morningstar. 4. What about some valuation statistics? Taking a look at Yahoo "Key Statistics" on Cohesant (COHT), we can see how small this company is! Recorded as a market cap as $34.75 million, this is what I refer to as a micro-cap stock (under $100 million in market capitalization). The trailing p/e is a reasonable 18.68. There is not forward p/e (probably no analysts that follow), and thus no PEG is possible. According to the Fidelity.com eresearch website, Cohesant is in the "Diversified Machinery" industrial group. Within this group, Cohesant is reasonably priced with a Price/Sales ratio of only 1.5. Leading this group is Shufflemaster (SHFL) with a ratio of 10.5, followed by Roper Industries (ROP) at 3, Illinois Tool Works (ITW) at 2.3, then Cohesant at 1.5, Ingersoll-Rand (IR) at 1.4, and Eaton Corp. (ETN) at 1.1. Thus, at least by this parameter, the stock is relatively inexpensive. Finishing up with Yahoo, we find that there are only 3.16 million shares outstanding with 1.11 million that float. Currently there are 1,860 shares out short as of 3/10/06, giving us a short ratio of only 0.8. This is only 0.1% of the float. So this isn't much of a factor. $10.50 in March, 2006. Thus, short-term, the upward momentum appears to has been possibly re-established. I probably would feel more comfortable to see the chart moving past the prior highs at the $14.50 level, before being convinced that the technicals were solid. Probably with another solid quarter which appears likely, we shall see this stock move higher. 6. So what do I think? This is certainly an interesting, if tiny company. The stock appears to be trading at least short-term positively. I think future appreciation will depend and result from continued positive earnings reports. The last quarter was great, the Morningstar.com report looks nice except for a bit of short-term earnings weakness the past couple of years. I like the increasing dividend, the stability in the number of shares, the free cash flow, and the solid balance sheet. Companies with small float always make me a bit cautious due to what I perceive as the magnified volatility inherent in these stocks. Good-luck with your investment! I hope that was helpful for you. The company still looks interesting and you may well be on to something big for you and your clients. If you have any comments or questions, please feel free to leave them on the blog or email me at bobsadviceforstocks@lycos.com and be sure to come and visit my Stock Picks Bob's Advice Podcast Site. One of my promises to all of you readers is to continue to share with you my actual trading portfolio and my analysis of the stocks that I actually hold. I do a lot of different things on this blog. Mostly, I am applying an investment strategy that I discuss throught this website, of selecting stocks with certain characteristics, and making decisions on when and how many shares to sell in each of my positionns, and how to shift back and forth between cash and equities. Starting about six months ago, I started a weekly review of my actual holdings, going alphabetically through the list which currently consists of 21 positions. About a month ago, I realized that this review would be too frequent and thus decided to start reviewing my holdings every other weekend. Two weeks ago I reviewed Hibbett (HIBB) on Stock Picks Bob's Advice. This week I am up to "Healthways" (HWAY) which was renamed from the former American Healthways (AMHC). 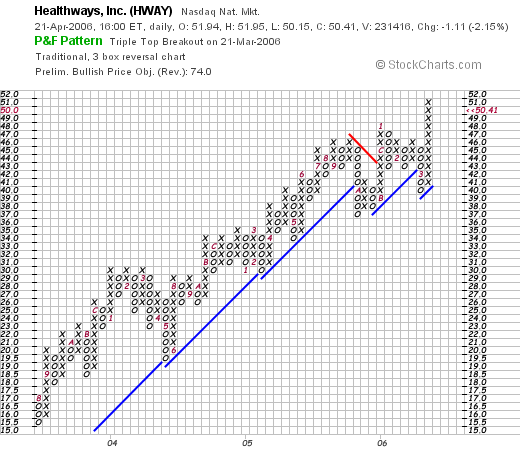 I currently own 128 shares of Healthways which closed at $50.41 on 4/21/06. These shares were purchased 6/18/04, a little under two years ago, with a cost basis of $23.53. Thus, I have an unrealized gain of $26.88 or 114.2% on these shares. I have sold portions of my holdings three times since my purchase: 75 shares sold 11/3/04 at a price of $32.65 (a 39% gain), 55 shares sold 4/25/05 at $39.69 (a 69% gain), and 42 shares sold 7/28/05 at $44.86 (a 91% gain). Thus, my fourth sale, which may be soon , should be at around a 120% gain level on the upside or 2.20 x $23.53 = $51.77. On the downside, I plan on selling all of my shares at the 50% of the highest sale point, which currently would work out to be at a 45% gain level (1/2 of 90%), or 1.45 x $23.53 = $34.12. Well let's take a look at the stock today and see if it still deserves a place in my trading portfolio! "...provides health and care support programs and services in the United States. The company offers disease management and care enhancement services to health plans, the centers for Medicare and Medicaid Services, and hospitals, as well as wellness programs to health plans and employers in 50 states in the United States, the District of Columbia, Puerto Rico, and Guam." "Based on the Company's results for the second quarter and first six months of fiscal 2006, and its outlook for the remainder of the fiscal year, Healthways today raised its established guidance for fiscal 2006. The Company increased its guidance for revenues for fiscal 2006 to a range of $415 million to $435 million from the previous range of $412 million to $432 million, as a result of a $3 million increase in revenues expected to be produced by the MHS pilots. Because of the higher than anticipated participation rates in the MHS pilots, the Company expects fiscal 2006 revenues from these pilots to be in a range of $25 million to $28 million. The Company's guidance for revenues from its core commercial business remains unchanged at $390 million to $407 million. The Company's guidance does not include any revenues from international sources for fiscal 2006. The Company's guidance for net income per diluted share for fiscal 2006 has been increased to a range of $1.16 to $1.19 from a range of $1.10 to $1.14, which includes the expected impact of the Company's LTI compensation program of $0.25 per diluted share. Excluding these costs, the Company's guidance for net income per diluted share for fiscal 2006 has been increased to a range of $1.41 to $1.44 from $1.34 to $1.38." This raised guidance was enough to push the stock price higher! Reviewing the Morningstar.com "5-Yr Restated" financials on HWAY, we can see the steady picture of revenue growth from $75.1 million in 2001 to $312.5 million in 2005 and $331.9 million in the trailing twelve months (TTM). Earnings have improved steadily except for the slight miss the latest quarter as noted above. Earnings have increased from $.11/share in 2001 to $.93/share in 2005 and dropped to $.89/share in the TTM. The company has increased its float slightly from 26 million shares in 2001 to 33 million in 2005 and 34 million in the TTM. Free cash flow has been positive and basically growing with $11 million reported in 2003, $59 million in 2005 and $53 million in the TTM. The balance sheet looks solid with $68.7 million in cash, enough to pay off both the $48.2 million in current liabilities and the $15.5 million in long-term liabilities combined. Insofar as the 'current ratio' is concerned, the company has $133.3 million in total current assetes (including the $64.6 million in other current assets), which when compared against the $48.2 million in current liabilities, yields a ratio of 2.77. Generally ratios over 1.5 are considered 'healthy'. 4. What about some valuation numbers on this company? Examining the Yahoo "Key Statistics" on Healthways, we find first of all that this is a mid-cap stock with a market capitalization of $1.74 billion. The trailing p/e is quite rich at 59.31, and the forward p/e is a bit better at 34.06. The PEG is moderate at 1.50. Reviewing the Fidelity.com eresearch website, we find that this company is in the "Specialized Health Services" industrial group. Even within this group, the company is richly valued with a Price/Sales ratio of 5.1, at the top of this group. Following HWAY is Lincare Holdings (LNCR) with a ratio of 3.3, United Surgical Partners (USPI) at 3.3, DaVita (DVA) at 2, Express Scripts (ESRX) at 0.8 and Caremark Rx. (CMX) at 0.6. Thus, by this ratio, this stock is also richly valued. Going back to Yahoo, we find that there are 34.52 million shares outstanding with 32.88 million that float. Of these, 3.74 million shares are out short as of 3/10/06, representing 11.30% of the float or 20.2 trading days of volume. This is up from 3.54 million the prior month. Using my 3 day rule, this suggests that there are a LOT Of shares out short, and with any good news could develop into a short squeeze. On the other hand, these short-sellers may be looking at the same valuation richness I just reviewed and believe that the stock should be priced lower. No cash dividends are reported, and the last stock split was a 2:1 split on December 22, 2003. 5. What about a chart? 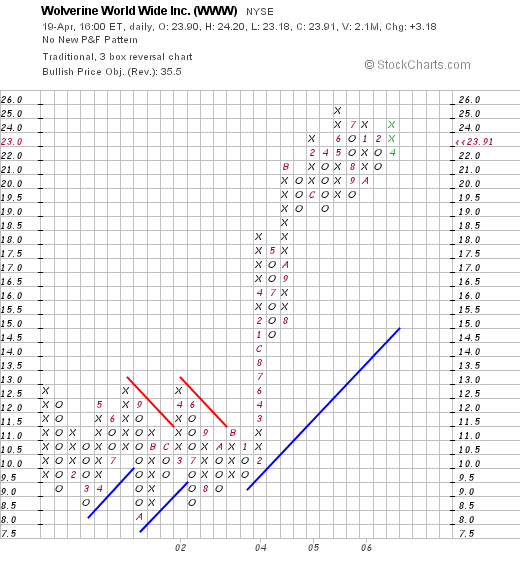 Looking at a "Point & Figure" chart on HWAY from StockCharts.com, we can see that the company stock rose strongly in price from July, 2003, until October, 2005, when the stock broke through support, and then faltered once again in March, 2006. However, after the latest earnings report, the stock responded strongly and moved to new highs. The stock has pulled back slightly from its recent highs. This stock has been very kind to me, and recently was trading in what I could only describe as "tired". After the latest earnings report, the stock is alive once again as growth prospects have once again been rekindled. However, pricing is a bit rich with both the p/e and Price/Sales ratios at the high end of similar stocks. The large number of short sellers may well be helping propel the stock higher at this point as they scramble to cover. It will be interesting to see what the next month's short number show and if indeed some of these sellers have covered. I do believe that intuitively this field of disease and healthcare management can only continue to be of great need as our society struggles with the growing healthcare needs of our aging population. Thanks so much for stopping by! If you have any comments or questions, please feel free to leave them on the blog or email me at bobsadviceforstocks@lycos.com. Also, please come by and visit my Stock Picks Bob's Advice Podcast Site. We have had a rather tumultuous week in the markets. The Dow hit a 6 year high, with the NASDAQ still sitting at almost 50% of its all-time high. And now we have oil flirting with $75/barrel levels never seen before. Gasoline is now working towards $3.00/gallon and the market has a lot of head-wind to go against with the Fed continuing to push short-term rates higher. But in the midst of all this, I stay focussed on stocks and let the action of my portfolio dictate my own activity in the market. If you are a regular reader here, you will know that the weekend is my time of reviewing past stock selections. I am now about 60 weeks out with my continuing review and try to keep you posted how all of my selections turned out. If you are interested in reading some past picks, you can find them by searching on Google with "Stock Picks XXXX" where XXXX represents the symbol you wish to find. Usually this works--it is my own approach to wading through my voluminous blog. You can also flip through the pages going by dates and clicking on the dates along the left side of my blog entries. You probably knew that anyhow. With my reviews I assume a 'buy and hold' approach. While this is an easy way to assess performance, in reality, I employ a much more disciplined selling strategy. I only allow a stock to decline 8% before unloading the shares, and on gainers, I start selling portions of my holdings as stocks reach appreciation levels of 30% and higher. That being said, I always enjoy taking another look at past stock picks which helps me see what is and what isn't working in this process. On February 2, 2005, I posted Pacer Intl (PACR) on Stock Picks Bob's Advice when it was trading at $22.74. PACR closed at $34.60 on April 21, 2006, for a gain of $11.86 or 52.2% since the posting. On February 8, 2006, Pacer reported 4th quarter 2005 results. For the quarter ended December 30, 2005, total revenue declined (5.1)% to $503.8 million from $530.8 million. Net income however, increased to $20.4 million or $.54/share, up from $17 million or $.44/share the same period last year. This represented an increase of 20% in net income and an increase of 22.7% in diluted earnings per share. On February 3, 2005, I posted Mercury Interactive (MERQ) on Stock Picks Bob's Advice when it was trading at $47.89. Mercury now is on the "pink sheets" and trades as MERQ.PK, and closed at $37.00 on 4/21/06, for a loss of $(10.89) or (22.7)% since posting. MERQ.PK is in the process of restating results and I cannot comment on the earnings without something solid to discuss. Finally, on February 4, 2005, I 'revisited' ResMed on Stock Picks Bob's Advice when it was trading at $59.84. ResMed (RMD) had a 2:1 split on October 3, 2005, making my effective pick price half of that amount or $29.92. RMD closed at $43.05 on 4/21/06, for a gain of $13.13 or 43.9%. On February 7, 2006, ResMed announced 2nd quarter 2006 results. Revenue for the quarter was $146.4 million, a 41% increase over the quarter ended December 31, 2004. Net income increased to $22.3 million from $17.4 million the prior year. On a diluted per share basis, this represented a 20% increase to $.30/share up from $.25/share. So how did I do with my stock picks during this week a bit over a year ago? I had two gaining stocks and one losing stock. The average percentage change was a gain of 24.5% on the three stocks. Not too shabby at all :). Anyhow, that's the review! Thanks so much for stopping by! If you have any comments or questions, please feel free to leave them on the blog or email me at bobsadviceforstocks@lycos.com. Please also come and visit my Stock Picks Bob's Advice Podcast Site. Wolverine World Wide (WWW) "Revisiting a Stock Pick"
Earlier today I sold a portion of my Starbucks (SBUX) as it hit a targeted appreciation level with a 240% gain. This generated a signal to me in my peculiar trading strategy, and entitled me to add a new position as long as I was under my 25 position maximum. Being at 20 positions, that 'nickel' started burning a hole in my pocket right away :). Looking at the list of top % gainers on the NYSE, I recognized an old favorite of mine, Wolverine World Wide, which was occupying the top % gainer position, and closed at $23.91, up $3.18 or 15.34% on the day. I went ahead and purchased 240 shares at $23.50 for my 21st position in my trading portfolio. With so many stock to choose from, I try to vary my selections to those stocks making moves higher the same day I make a sale on a gain. I could call this my "alphabet soup technique". I sort of let the market bubble the best names to the top and then I pick through the parcels of letters to see which I wish to take a bite of. Anyhow, three 'W's' bubbled to the top of the market today and I liked the taste of this one, although some may say it tasted as tough as shoe-leather! Wolverine World Wide (WWW) is a stock that I posted on Stock Picks Bob's Advice on October 6, 2004 when it was trading at $28.90. As I noted in the prior note, the stock had a 3:2 split in February, 2005, giving me an effective stock pick price of $19.27. Let's take a brief look at this stock and I will show you why I went ahead and bought some shares. 1. What does this company do? "...engages in the design, manufacture, and marketing of a line of casual shoes, rugged outdoor and work footwear, and constructed slippers and moccasins primarily in the United States. It offers work, outdoor, uniform, and lifestyle boots and shoes; performance and lifestyle footwear; and comfortable casual, dress footwear, and slippers through its Wolverine Footwear Group, Outdoor Group, Heritage Brands Group, and Hush Puppies Company." This morning, before the open of trading, WWW announced 1st quarter 2006 results. For the quarter ended March 25, 2006, revenue came in at $262.8 million, up 7.2% over the same quarter last year when the company had revenue of $245.2 million. Earnings for the quarter grew 25.9% to $.34/share up from $.27/share the prior year. As reported, this result was $.04 ahead of consensus estimates and the company went ahead and guided to the high end of estimates. Thus this was a "trifecta plus" in my convoluted thinking, that is, the company reported positive earnings growth, positive revenue growth, beat estimates, and raised guidance. What else could an investor possibly want in an earnings announcement? Let's review the "5-Yr Restated" financials on WWW from Morningstar.com. First of all revenue growth. The company has an outstanding record of steady growth with $701 million in revenue in 2000, climbing steadily to $992 million in 2004 and $1.05 billion in the trailing twelve months (TTM). Earnings have also been steadily growing with $.17/share reported in 2000 growing to $1.09/share in 2004 and $1.25/share in the TTM. The company also pays a small and growing dividend with $.09/share reported in 2000 growing to $.17/share in 2004 and $.22/share in the TTM. Now here is another nice detail: the company has been overall reducing the number of shares outstanding. There were 62 million shares reported in 2000; this dropped to 57 million shares in 2004 before rebounding to 59 million in the TTM. Overall, this reduction of shares is another strong selling point for this stock. Free cash flow has been positive and overall improving with $74 million in 2002, growing to $88 million in 2004 before pulling back to $80 million in the TTM. The balance sheet looks strong to me with $47.8 million in cash and $416.9 million in other current assets. When we combine the current assets, and compare this to the $135.4 million in current liabilities, we reach a ratio of 3.4. Ratios of 1.5 or higher are generally considered healthy. This one looks solid. The current assets easily can pay off both the current liabilities of $135.4 million and the $71 million in long-term liabilities combined. 4. How about some valuation numbers? Looking at "Key Statistics" from Yahoo on WWW, we can see that this company is a mid-cap stock with a market capitalization of $1.30 billion. The trailing p/e is a reasonable 18.84 with a forward p/e (fye 31-Dec-07) even nicer at 15.83. The PEG (5 yr expected) is quite nice at 1.13. 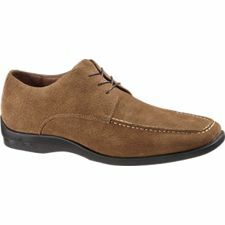 According to the Fidelity.com eresearch website, Wolverine World Wide (WWW) is in the "Textile-Apparel Footwear/Accessories" industrial group. Topping this group in terms of Price/Sales ratios is an old favorite of mine, Coach (COH) with a ratio of 7.1. 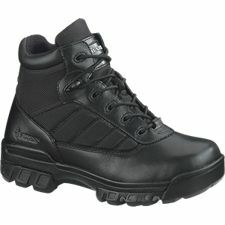 This is followed by Nike (NKE) at 1.5, and Timberland (TBL) at 1.5. Wolverine is next to the last with a ratio of 1.1, and Rocky Shoes & Boots (RCKY) is the cheapest stock by this perspective with a Price/Sales ratio of 0.5. Finishing up with Yahoo, we can see that the company has 54.56 million shares outstanding with 54.78 million of them that float. Currently as of 3/10/06, there are 1.67 million shares out short representing 3.20% of the float or 3.3 trading days of volume (the short ratio). This doesn't look too significant to me in terms of any potential 'squeeze'. The company, as I noted earlier, pays a dividend of $.27 yielding 1.30%. The last stock split, as also noted earlier, was a 3:2 split on 2/2/05. 5. What about the chart? Looking at a "Point & Figure" chart on WWW from StockCharts.com, we can see that the stock actually was trading sideways between January, 2001, and February, 2004, when it traded in a range between $8 and $12.50. However, i n February, 2004, the stock started steadily moving higher, breaking through past resistance levels and moving to the current $24 range. The stock chart looks strong to me if a tad over-extended. So how about a 'shoe stock'? In my system, what the company makes is not as important as the underlying financial performance. Thus, when the stock made a move higher today, with the solid earnings report, nice Morningstar.com report, reasonable valuation, and good chart, this was the kind of stock I felt I needed to be buying and did. Was it a good move to swap out of Starbucks, that great growth stock into a shoe stock? Time will tell. I will tell you that my last sale of Starbucks found me buying shares of Dynamic Materials (BOOM). Anyhow, I wanted to get this explanation on the blog before I crashed tonight. I was up way too late last night and up early this morning for a walk. Time to get some more sleep :). Thanks again for visiting! If you have any questions or comments, please feel free to leave them on the blog or email me at bobsadviceforstocks@lycos.com. Please be sure to visit my Stock Picks Bob's Advice Podcast Site where I share with you my same thoughts on many of the stocks I am blogging about! Have a great night and a wonderful day tomorrow! Hello Friends! Thanks again for visiting my blog, Stock Picks Bob's Advice. As always, please remember that I am an amateur investor, so please remember to consult with your professional investment advisors prior to making any investment decisions based on information on this website. Having sold a small portion of Starbucks (SBUX) at a gain, I set out today to find a new position to add to my trading portfolio. One of the top NYSE issues on the top % gainers list is an old favorite of mine, Wolverine World Wide (WWW) which is a shoe wholesaler, making the likes of "Hush Puppies". The company announced good earnings, the price of the stock rose, and I picked up 240 shares of WWW at $23.50/share a few moments ago. I first posted WWW on Stock Picks Bob's Advice on October 6, 2004, when the stock was trading at $28.90. The stock split 3:2 on 2/2/05, making my effective pick price $19.27. Thus, with the stock currently trading at $23.50, the stock is showing a gain of $4.23/share or 22% since being selected on the blog. Thanks so much for visiting! If you have any comments or questions, please feel free to leave them on the blog or email me at bobsadviceforstocks@lycos.m. Please also be sure to visit my Stock Picks Bob's Advice Podcast Site. A few moments ago I realized that my Starbucks (SBUX) stock had hit a sale point for me, reaching a 240% appreciation level. Unfortunately, I am down to 59 shares, but 1/6th of that works out to 9 shares and I sold 9 shares at a price of $38.96. I had purchased this position 1/24/03 at a cost basis of $11.40, so this worked out to a gain of $27.56 or 241.8% since my purchase. Having sold previously five times (at 30, 60, 90, 120, and 180% levels), my goal was for a sale at 240% and I reached it with SBUX! Anyhow, that nickel is burning in my pocket already. I shall be on the lookout for a new position to add to my trading portfolio since I am only at 20 positions, with my maximum of 25! Regards! Drop me a line at bobsadviceforstocks@lycos.com if you have any comments or questions, and please feel free to visit my Stock Picks Bob's Advice Podcast Site. Sure was a strong market today! Seemed like everything was moving higher. But that doesn't really affect my strategy. I am waiting for my stocks to hit their targets before selling anything and before adding a new position. But that doesn't mean I stop looking for new names to discuss here! Scanning the list of top % gainers on the NASDAQ today, I came across Franklin Electric Co. (FELE) which had a great day as well, closing at $60.77, up $7.77 or 14.66% on the day. I do not own any shares nor do I have any options on this stock. Let me share with you why I like this particular company, a company I don't recall ever looking at before today! Let me take you some of the steps I use to identify my "stock picks" for this blog. "...together with its subsidiaries, engages in the design, manufacture, and distribution of groundwater and fuel pumping systems, electronic controls, and related parts and equipment. 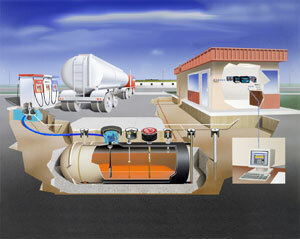 The company offers submersible motors, drives, pumps, controls, and monitoring devices. Its motors and pumps are used in submersible applications for pumping fresh water, fuel, wastewater, and other liquids in various applications, including residential, industrial, agriculture, fueling, off-shore drilling, and mining." 2. How did the company do in the latest quarter? Well this is exactly what drove the stock higher today! Because, after the close of trading yesterday, the company announced 1st quarter 2006 results. For the quarter ended April 1, 2006, sales came in at $111.0 million, up 35% from $82.4 million in the same quarter the prior year. Net income grew 67% to $9.7 million from last year's $5.8 million. On a per share basis, this worked out to $.42/share, up 68% from $.25/share the prior year. This was a SOLID quarter imho. 3. How about longer-term results? My favorite place to get this information is the Morningstar.com "5-Yr Restated" financials on Franklin Electric. Starting with revenue, we can see the steady growth in revenue from $322.9 million in 2001 to $439.6 million in 2005. Earnings/share also have increased in an extremely steady fashion from $1.20/share in 2001 to $1.98/share in 2005. The company also pays a dividend and has been consistently increasing that dividend each year from $.24/share in 2001 to $.38/share in 2005. Finally, looking at the number of shares outstanding, looking again for steady numbers, we can see that the company had 22 million shares in 2001 and kept the number steady, reporting 22 million shares in 2005. Free cash flow is positive and growing with $32 million reported in 2003, growing to $56 million in 2005. Finally, looking at the balance sheet, we find the company with $88.1 million in cash, enough to pay off all of the current liabilities as well as much of the $48.2 million in long-term liabilities. Calculating the "current ratio", which is a comparison of total current assets (the $88.1 million in cash and the $114.9 million in other current assets) compared with the $64 million in current liabilites gives us a ratio of 3.2. Using 1.5 as a signal of good health, this is a solid current ratio. The balance sheet also looks nice to me! Reviewing the Yahoo "Key Statistics" on Franklin Electric, we find that this company is a mid-cap stock with a market capitalization of $1.37 billion. The trailing p/e is a moderate 30.65 and the forward p/e (fye 31-Dec-07) is even nicer at 21.78. With the rapid growth anticipated, valuation looks even more reasonable with a PEG (5 Yr expected) of only 1.18. Using the Fidelity.com eresearch website, we find that this company is in the "Industrial Electrical Equipment" industrial group. There is a wide range of valuation in this group on Price/Sales ratios, with Ballard Power (BLDP) topping the group with a ratio of 18. Franklin Electric (FELE) is next at 2.8, Emerson Electric (EMR) follows with 1.9, GREATBATCH (GB) is next at 1.8, ITT Industries (ITT) at 1.4, and Energizer (ENR) at 1.1. Thus by this ratio, Franklin is on the richer valuation end of the group. Finishing up with Yahoo we find that there are 22.49 million shares outstanding with 18.19 million that float. As of 3/10/06, there were 800,160 shares out short, representing 15.9 average trading days of volume (the short ratio). If the shorts have not already covered (witness the large % gain today), there will be continued pressure on them to cover their sold shares to limit their losses as the stock price rises. This could be a significant factor in this stock. As noted, the company pays a dividend of $.40/share yielding 0.80%. The last stock split was a 2:1 split on June 16, 2004. What about a chart? 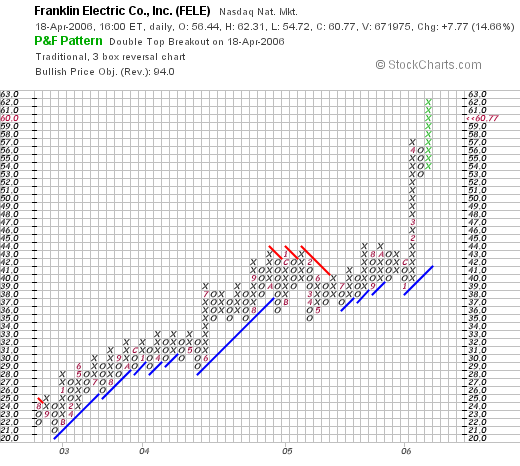 Looking at the "Point & Figure" chart on Franklin Electric Co. from StockCharts.com, we can see that the stock has been gaining strength even as it rose during 2003, 2004 and 2005. Finally, in January, 2006, the stock moved sharply higher from the $40 level to $56, and now once again is on the upswing. The stock may be a bit over-extended by this certainly is a strong chart to me. In summary, the stock had a strong move higher today, along with much of the entire stock market, yet still one of the top % gainers in the midst of all of the strong stocks today! They rose on the report of a SOLID quarterly report. 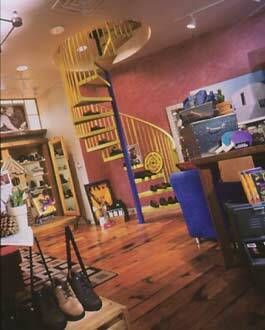 The company has had an extremely consist past five years. It is the consistency in growth that really attracts me to Franklin. Let's review the Morningstar once again: consistent revenue growth, consistent earnings growth, consistent dividend growth, steady free cash flow growth, unchanged # of shares, and a strong balance sheet. Valuation isn't too bad with a moderate p/e and a PEG just over 1.1. The Price/Sales is indeed a bit rich but then again, this one just might be worth it! On top of this, there are lots of shares out short and the chart is quite strong. What else could an investor want? Thanks again for stopping by and visiting my blog. Please feel free to leave comments on the blog or email me with your comments or questions at bobsadviceforstocks@lycos.com Please be sure to visit my Stock Picks Bob's Advice Podcast Site! A Reader Writes: "I am reticent to sell any in the face of potential future gains." Hello Friends! Thanks so much for stopping by and visiting my blog, Stock Picks Bob's Advice. As always, please remember that I am an amateur investor, so please remember to consult with your professional investment advisors, prior to making any investment decisions based on information on this website. My name is Gray G. I currently live on Whidbey Island north of Seattle in the north Puget Sound. We, my wife and I moved here from northern Illinois to be closer to our grandchildren a few years ago. We have less that 10 years untill we reach 65. I have enjoyed your comments about snow in Wisconsin though I will admit to be happy to be out of the snow belt. Our investment account is our primary retirement account and I try to grow it carefully. Thanks for your obvious effort that you put into the website and the podcast. I have been reading for some time now. I review from 6 to 12 stock blogs daily and yours is one of my regulars. I have valued your sell advice. understanding the simplicity of your guidelines. I can make any system too complicated and then lose sight of the goal..profit. I have two questions if I may. One, do you ever find a reason to hold on to a stock in the face of good news rather than sell? a list of screeners and evaluative websites including IBD and Morningstar. I review performance via StockCharts.com and http://www.stockta.com/ to tell me what the market is doing with respect to that individual stock. I had purchased small holdings in 3 stocks within the last 12 months that have moved up 40%,50% and 87%. One stock I did sell a portion at 30% but all three looked capable of moving higher.... and did. My dilemma is that all three stocks are still rated as bullish in both short and long term. I am reticent to sell any in the face of potential further gains. Please give me your thoughts on this. in the investment business" . I have had some infamous holdings...comcast,global crossings and worldcom, and can ill afford such loses. Please comment as I am sure there are still many people who pay for financial advice. Please also know that I will not make any decision based solely on your comments. I gather information from others and then decide based on a pool of information. Gray, thank you so much for writing. I took the liberty of posting your letter in the blog as I believe you raise questions that many investors, including me, regulary struggle with. Regarding your first question, about whether I ever find a reason to hold on to a stock in the face of good news rather than sell? You bring up an example of three stocks you own which seem to still have positive price momentum and you are reluctant to sell anything. I think you know my answer :) before I give it to you. Many, many times, I have wondered about whether I should be selling portions of strong stocks when maybe I should even be adding to these positions as they still look like they have great potential. However, it isn't what I do. I try to stack my deck in my portfolio. I only want to own stocks that have bullish outlook and I expect all of them to rise in price! However, if you can buy into my concept that successful investing will involve selling losing stocks quickly and totally and selling gaining stocks slowly and partially, you will know that I would start selling 1/6th positions of my holdings if I were in your shoes, as they hit my appreciation targets. Selling 1/6th gives one peace of mind. You have taken some money off the table. You aren't gambline with a continued rise in the stock yet you are still letting your position actually continue to grow in size! There isn't anything wrong with "letting it ride" as you state. In fact, most financial advisors would tell you to do exactly that. However, I believe the disciplined selling of stocks as they appreciate will protect you in the long run from stocks that climb high and then collapse....and then you will be wishing you had done exactly what I advise, sellling a little bit as the stock climbs in price. What to do with what you have inherited? I would sell anything that didn't have a good earnings report, a solid Morningstar.com report with steady earnings and revenue growth, free cash flow growth, and a nice balance sheet. If you want to start a portfolio, depending on the size of your funds, I like to suggest starting at 50% equity and 50% cash. Use sells at gains (1/6th sales) as signals to buy additional positions. Use sales of positions (on 8% losses, etc.) as a signal to "sit on your hands" and allow your portfolio to drop to a minimum of 1/4 invested (1/2 of the original # of positions). At that point, go ahead and replace your positions. I have a very mechanical approach to investing. But this discipline, I believe, will allow me to be successful in the long-run. My portfolio is made up of stocks that I review on the blog. Scan through my entries and you will find all of my transactions both purchases and sales. Let me know if you have any other questions. 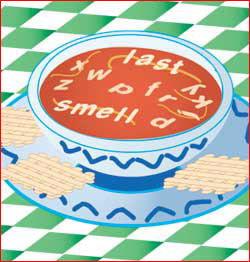 Good-luck and thank you again for your kind words and allowing me to reprint your letter here. With oil climbing above $70/barrel, and with instability in the mideast, the market took it on the chin today, dropping 63.87 to 11,073.78 on the DJIA, and dropping 14.95 to 2,311.16 on the NASDAQ. In spite of the overall market weakness, I found an old favorite of mine on the list of top % gainers on the NASDAQ: Infosys (INFY). INFY closed at $84.78, up $9.80 or 13.07% on the day. I do not own any shares of this stock nor do I have any options. I first posted Infosys on Stock Picks Bob's Advice on October 10, 2003, when the stock was trading at $77.40. My effective pick price is actually only $38.70 as Infosys had a 2:1 stock split on July 7, 2004. Thus, this stock has gained $46.08 since being selected on the blog, or a gain of 119%. Let's take another look at this stock which bucked the tide today, making a strong move higher in an otherwise weak market. "...provides consulting and information technology services primarily in North America, Europe, and the Asia-Pacific region. Its solutions include custom application development, maintenance and production support, software re-engineering, package evaluation and implementation, and information technology consulting." This company is an information technology outsourcing firm based in Bangalore, India. On April 14, 2006, this past Good Friday Holiday when the stock market was closed, Infosys reported 4th quarter 2006 results. For the quarter ended March 31, 2006, revenues came in at $593 million, up 30% from the same quarter the prior year. Earnings per American Depositary Share (ADS) jumped to $.56/share from $.47/share last year. The company also went ahead and announced a 2:1 stock split subject to shareholder approval and estimated another 28-30% growth for Fiscal 2007. These were all great results and even though the market was down overall, INFY made a strong move higher today! Reviewing the Morningstar.com "5-Yr Restated" financials we see a very pretty picture! Revenue has steadily grown from $414 million in 2001 to $1.6 billion in 2005. Earnings have also steadily increased from $.49/share in 2001 to $1.52 in 2005. Dividends have increased from $.04/share in 2001 to $.13/share in 2004 with $.72/share paid in 2005. Shares outstanding have remained fairly stable with 264 million in 2001 increasing to 267 million in 2005 and 271 million in the trailing twelve months (TTM). Free cash flow has been strong if not steadily increasing. 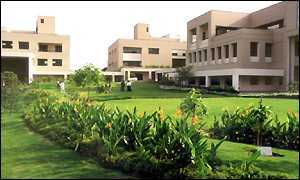 INFY reported $168 million in free cash flow in 2003, $279 million in 2004 and $158 million in 2005. The balance sheet is gorgeous imho. The company is reported to have $688 milllion in cash, enough to pay off the combined $175 million in current liabilities and the $26 million in long-term liabilities combined more than 3x over! Calculating a current ratio, combining the $688.0 million in cash and the $372.0 million in other current assets gives us $1.06 billion, which when compared to current liabilities of $175 million, yields a current ratio of 6.06. Generally anything at 1.5 or higher is considered 'healthy'. 4. How about some 'valuation' numbers? Reviewing Yahoo "Key Statistics" on Infosys, we find that this is a large cap stock with a market capitalization of $23.27 billion. The trailing p/e is a bit rich at 44.39, but the forward p/e (fye 31-Mar-07) is better at 28.35. 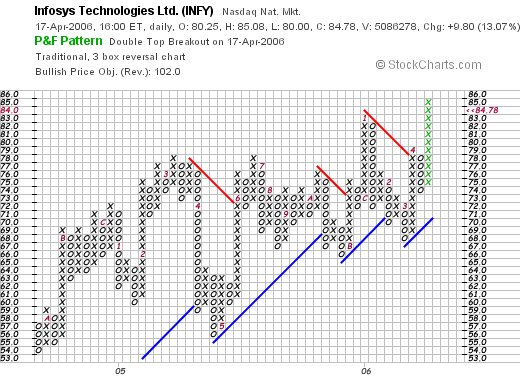 With the fast growth expected INFY has a very nice PEG of only 1.05. Using the Fidelity.com eresearch website, we find that Infosys is in the "Technical/System Software" industrial group. Within this group, INFY has the richest valuation, with a Price/Sales ratio of 10.4. Next in the group is Autodesk (ADSK) with a ratio of 6.8, followed by Mercury Interactive (MERQ) at 3.8, Manhattan Associates (MANH) at 2.3, and Take-Two Interactive (TTWO) at 1.4. At least by this measure, Infosys is 'no bargain'. Finishing up with Yahoo, it is reported that INFY has 274.52 million shares outstanding, with 213.88 million that float. As of 3/10/06, there were 1.78 million shares out short representing 2.5 trading days of volume (the short ratio). This doesn't look significant to me (less than my 3 day cut-off). As noted, the company currently pays a regular dividedn of $.30/share yielding 0.40%. The last stock split, as noted above, was a 2:1 split on 7/7/04. We can see that this stock has been moving fairly steadily higher from $54 range in August, 2004, to the current peak of $84.78. The stock has moved steadily higher with higher lows and higher highs, but doesn't appear 'over-extended' imho. So what do I think about this stock? Let's review: the company reported a superb earnings report prior to trading today and the stock climbed strongly this morning ignoring the overall bearish tone in the market with oil pushing past $70. The Morningstar.com report is very nice with steady growth in both revenue and earnings the past five years. Free cash flow is positive and the balance sheet is gorgeous. Valuation-wise both the P/E and the Price/Sales are rather 'rich', but the PEG is reasonable just over 1.0. Finally the chart looks reasonable and not too over-extended. In summary, I like the stock even if it is an ADS, or foreign company. Thanks so much for stopping by and visiting! If you have any comments or questions, please feel free to leave them on the blog or email me at bobsadviceforstocks@lycos.com. Please be sure to also visit my Stock Picks Bob's Advice Podcast Site! A Reader Writes "What would you do if you were in the same boat?" Anyway, I’m quite impressed with your grasp of the markets and picking good stocks. Your current holding made me very jealous! I’m still trying to figure it all out, even after investing in mutual funds (and some individual stocks) for the past 16 years. I’ve read TOO many books and now have serious information overload. I thought I liked CANSLIM, and also found PITBULL which is a modified CANSLIM approach. But what I seemed to discover about those is that you must have good timing because so many people are following CANSLIM. Many times, by the time I would consider a stock, it had already made a significant move. I’ve been reading a lot lately about value investing. For me, this approach seems to make the most sense, and requires the least amount of time “watching the tape” during the day. I work as a computer engineer and just don’t have time during my busy days to keep an eye on the markets. My biggest mistakes in investing seem to happen whenever I purchase individual stocks. Back in March 2000, as I’m sure many people did, I purchased CSCO and MSFT. Unfortunately, I’m still holding them at a significant loss hoping they will one day come back. Actually, I’m about at break-even with MSFT due to a subsequent stock split. I also recently purchase GEOI based on a mention by Jim Cramer that seemed to make sense at the time. I bought around $15, and as you can see, it has dropped since then. I’m still holding that too (haven’t perfected my sell strategy or emotions) and waiting for it to come back. The only other individual stock I play with is the company I work for, and I do OK with that one. The symbol is HCR and I like to buy/sell inside my 401K as the stock rises and falls. In fact, it’s looking like time to buy again! I’m curious to know your thoughts on the above stock purchase mistakes I’ve made… What would YOU do if you were in the same boat? Would you dump CSCO, MSFT, GEOI and just take the loss so you could move on to better stocks? Or would you possibly buy more to average your cost basis down a bit? First of all Dave, thanks so much for writing. You make some very good observations and I appreciate very much your participation on my blog. I have been very fortunate to pick stocks that have performed very well for me. But I haven't picked all winners! Let me try to respond to your comments and questions in order. You write that by the time you consider a stock, it had already made a significant move. I should note that most of my stocks also had made significant moves prior to my purchase. Just look at SanDisk (SNDK) that I just purchased a few days ago. The stock has already made a large move higher. I went ahead and bought shares anyhow. We'll have to see if I was too late on that one. I do not follow the CANSLIM approach of picking up stocks at new highs. Instead, I am looking at stocks making large percentage gains. Often these stocks are at highs, but many times they are not. It is counter-intuitive to purchase a stock after it has moved significantly higher. I believe that a move higher is a positive factor in my review. I like to see a chart with a stock that has already been acting very healthy...moving higher in price. While most of us generally would like to believe that we can buy stocks that after we purchase them start moving higher (wouldn't that be great? ), it is what I would call a higher percentage shot to pick a stock that has already moved higher and expect it to move higher. I believe I have greater success at this because of my disciplined assessment of some basic fundamentals when looking at stocks. I am not as excited about the "story" but more about the past quarter, the past several years, the free cash flow, the balance sheet, and some valuation numbers. I do not consider it coincidental that a company generates strong results over a period of years. I view that as a sign of good management, perhaps the presence of what some talk about a "moat" that insulates the company from competition. But I let the numbers speak for themselves. I also have investments in mutual funds. I have those in some retirement plans. But I believe that it is possible to pick individual stocks successfully. I suspect that one of your basic mistakes, a problem that I had for many years, is to be a "top-down" investor. I believe you can be successful if you are more of a "bottom-up" stock-picker. Your picks have been those of the popular 'story stocks'...stocks like Cisco, Microsoft, and a Jim Cramer selection GEOI. You fell into HCR that is a stock (Manor Care) that I have reviewed here on Stock Picks previously. And yet you like to sell the stock on swings of price and buy it back when it drops. As long as that is successful for you, I have no complaints. But what about these stocks that you own? What should you do? What would I do? First of all, there really are two questions that you are asking: are these good investments, and how would I handle these positions? I cannot predict whether these stocks will work out to be good investments. If they increase in price, then they are great. Probably, I would just assign them a new "basis" which would be the closing price on Thursday. This basis would not be for tax purposes but for dealing with the stocks today. If they appreciated 30%, I probably would use that as a signal to make a new purchase, and if they drop 8%, etc., I would wsell the stocks. Sort of as if I had purchased them Thursday. Better yet, is the question of whether you are developing new techniques of purchasing and selecting stocks. Are you developing a disciplined strategy that will reveal new stock market ideas? That is what I do on my blog. You are welcome to adapt or modify my strategy for your use. Or use anything else that works for you. Try to avoid just buying stocks that you have "heard about." Develop a system that will give you some new names however you wish to manage this. You talk about value investing. Sure did work for Warren Buffett! It just isn't my approach. My basic strategy is to find the strongest stocks out there. If you use the horse race analogy, I want to own a bunch of horses that are regularly winning their races! I am not looking for a stock with good lineage that OUGHT to eventually start winning. I stay with the tried and true. A strong stock, that I consider a "quality" investment is not about market cap. It is not about being mentioned on Jim Cramer. It is not Peter Lynch style a stock that I personally understand and use their product. It is a company that can consistently increase its earnings and revenue. A company that generates free cash, doesn't expand the number of shares too quickly, and has a solid balance sheet. I don't care if they make widgets or pairs of shoes. The market will reward those companies with higher stock prices over time. I avoid stocks in general that are tied to commodity markets. Stocks like oil stocks and gold stocks. Their fortunes will be tied to the underlying price of the commodity which might be great but then again is too much of a crap shoot for me. I haven't directly commented on your companies. Most don't look bad, just check their latest quarter, the Morningstar.com reports, and their graph. You can make your own decisions on them. Don't get too attached to your stocks in the future. When they move lower, keep your losses small by selling declining stocks quickly and completely. Go ahead and hedge your bets by selling small amounts of stock as they appreciate in price. It is this bias that will result in your success as a stock picker and investor. Good-luck and keep me posted on your progress! Please be sure to visit my Stock Picks Bob's Advice Podomatic Site.